Archipiélago compuesto por cuatro islotes, por así decirlo, semi abandonados, pero, que hacen las delicias de los amantes de la exploración submarina. El parque natural de los Cayos de Tobago es un pequeño paraíso. El arrecife de Horseshoe nos muestra una de las construcciones naturales más espectaculares. Los islotes tienen buenos anclajes protegidos y nos hemos aferrado a uno de ellos para pasar un par de días y disfrutar de este hermoso lugar. This entry was posted on 17 enero 2010 at 13:34 and is filed under Cayos de Tobago (Granadinas). You can follow any responses to this entry through the RSS 2.0 feed. You can leave a response, or trackback from your own site. This photo is made from an airplane? Seem to me that yes? Do lots of pictures, please so I can see where you are in paradise. Your english is improving a lot. 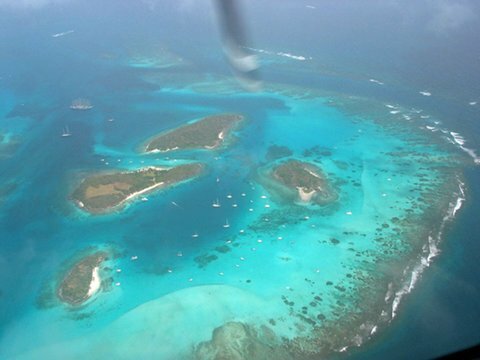 Yes, the picture is taken from an airplane since it is the only way to have a general overview of the islands. This is really a paradise and we regret that you cannot enjoy of it together with us. We have many pictures and we will prepare a CD and will send it to Jordi for distribution. Best wishes and kisess too.